Thurman retains his unblemished record—and his welterweight title—with a majority decision victory over Josesito Lopez. The WBA Welterweight World Champion reflects on his return victory over Josesito Lopez, and addresses reports of potential bouts versus Adrien Broner and Manny Pacquiao. Welterweight champion survived some scary moments against "Riverside Rocky" in his first fight in nearly two years to retain his WBA title Saturday night on PBC on FOX in Brooklyn. Keith Thurman says he’s still the top dog of the welterweight division, but if he’s lost anything—Josesito Lopez says he will expose him tomorrow night on PBC on FOX. Equal parts force and finesse, unbeaten 147-pound world champion Keith Thurman has become a fan favorite thanks to his blend of punching power and personality. Boxing has been a lifelong passion for Thurman, who entered the sport at the age of 7 and has been primed for stardom ever since. Born in Clearwater, Florida, Keith Thurman was discovered at the age of 7 by renowned trainer Ben Getty. At the time, Getty was holding a boxing exhibition in the cafeteria of Thurman’s school. Thurman took the sign-up sheet home to his mother in order to participate in the event, and told her that he wanted to box. The fighter known as "One Time” been doing so ever since, and the undefeated 147-pound world champion has become one of boxing's top stars with his fan-friendly style and natural, almost offhanded charisma. As an amateur fighter, Thurman won six national championships and recorded more than 100 victories, setting the stage for a promising pro career. After Getty passed away in 2009, Thurman moved into the stable of Dan Birmingham, best known for helping turn Jeff Lacey and Winky Wright into world titlists as well as having worked with former world champion Chad Dawson for a time. Keith Thurman and Jesus Soto Karass exchange punches during their interim 147-pound title bout on December 14, 2013, in San Antonio, Texas. Thurman has earned nearly all of his victories by knockout. And a number of them have come against some of the most rugged participants in a rugged sport. To wit, Thurman burst onto the national scene with a savage four-round destruction of former world champion Carlos Quintana in November 2012. Quintana retired after the brutal loss. From there, Thurman would hand no-nonsense Argentinean Diego Chaves his first defeat via 10th-round knockout, winning an interim 147-pound title in the process, before gaining a ninth-round technical knockout of Mexican tough-guy supreme Jesus Soto Karass. In his last bout as interim champion, Thurman won a unanimous decision over Italian star Leonard Bundu in Las Vegas on December 13, 2014. Keith Thurman punches Jan Zaveck during their 147-pound title fight on March 9, 2013, at Barclays Center in Brooklyn, New York. As intense as he can be inside the ring, Thurman is a thoughtful, engaging presence outside of it. A voracious reader fond of books with a philosophical bent, Thurman’s a laid-back guy who drives a Prius and chills with his Chihuahuas. But when the bell rings, another side of Thurman comes out. Despite his nickname, “One Time” has demonstrated that he can go the distance. In March 2013, Thurman won a grueling 12-round decision over former champion Jan Zaveck, a rough-and-tumble Slovenian with a stout defense. That fight, in particular, underscored a key point: Thurman’s a boxer who can brawl, not the other way around. “I want to have eyes like a shark, but also eyes like an eagle,” he told the Tampa Bay Times in 2010, highlighting his emphasis on ring savvy as opposed to merely hunting for knockouts. Keith Thurman lands a left hand during his victory over Robert Guerrero on March 7, 2015. Thurman took on four-division champion Robert Guerrero at the MGM Grand Garden Arena in Las Vegas on March 7, 2015, in the first Premier Boxing Champions card. Fighting on prime time on NBC, Thurman stepped up his game in winning a 12-round unanimous decision. He won nearly every round on all three judges' cards, and scored a ninth-round knockdown. With the win, Thurman improved to 25-0 and solidified his status as one of the world's top fighters in the 147-pound division. Returning to fight in the Sunshine State for the first time since 2009, Thurman made his homecoming as world champion by taking on former titleholder Luis Collazo at the USF Sun Dome in Tampa on July 11, 2015. While firmly in control for most of the fight, Thurman was rocked in Round 5 by a body shot that nearly brought him to a knee. He remained steadfast, though, and opened a cut above Collazo’s right eye that caused the challenger’s corner to throw in the towel after Round 7. In June 2016, Thurman defended his title for the third time against former world champion Shawn Porter. Fighting before a crowd of 12,718 at Barclays Center and a national television audience on CBS, Thurman earned a close unanimous decision—all three judges scored the bout 115-113—in a high-action contest that earned consideration for Fight of the Year. Thurman made the leap from champion to star in his next fight as he returned to Brooklyn in March 2017 to face unbeaten two-division champion Danny Garcia, who stepped up from 140 pounds to win a vacant 147-pound crown in January 2016. Their fight was not only the 10th title unification in division history, it was just the third between undefeated welterweights, following 1981’s Fight of the Year between Sugar Ray Leonard and Thomas Hearns and 1999’s Felix Trinidad-Oscar De La Hoya showdown. 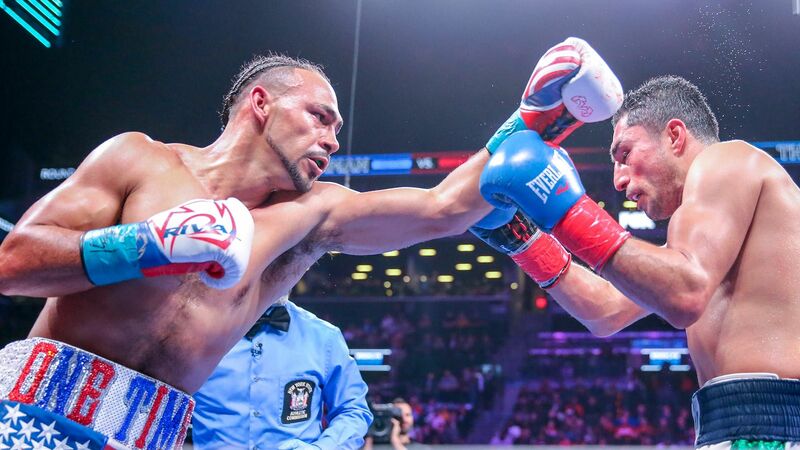 With a Barclays Center boxing-record crowd of 16,533 watching along with a national prime-time audience on CBS, Thurman edged his way to a split decision over Garcia to entrench himself firmly atop the division.